If you hadn’t figured it out, we take a yearly trip to Disney World. Time for a re-cap. This time, we went all out. 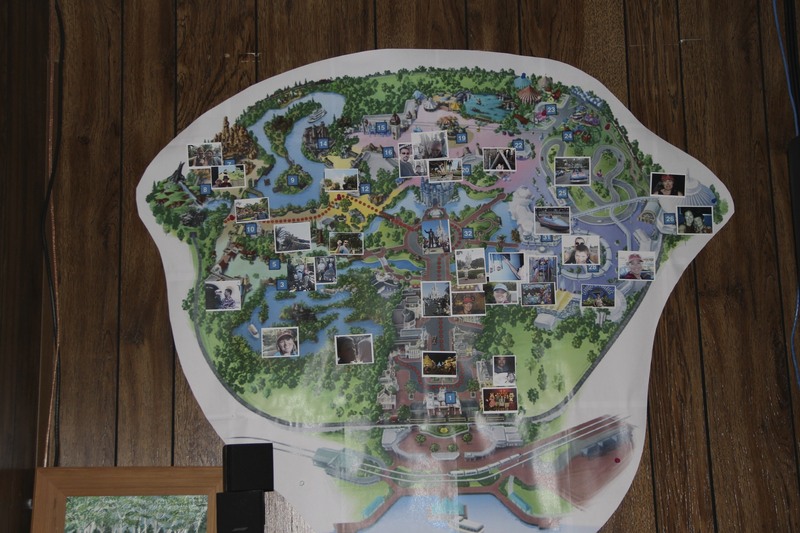 During our last trip, I managed to sneak away and check into the numbers for DVC. A few weeks later, I closed the deal through the mail. Without spilling all the beans; monthly, it is cheaper then the car payment we had just gotten rid of. Reagan loves puzzles, so for Christmas, she got a scroll that contained a date, latitude/longitude, and the number 7. She quickly figured out that on that date, we would be at that location for 7 nights. Then off to the computer to track it. The point landed at the hub in the Magic Kingdom. The jumping up and down and screaming started followed by a double or nothing challenge….Want to figure out where we are staying, solve this. I gave her a handmade book of hidden Mickeys to locate. She loves these things. She buys the books to find all the hidden Mickey Heads and walks around checking them off. This one stumped her, she didn’t know where they were. Hehe. A search of ‘hidden mickey elevator door’ brought here right to Bay Lake Tower, but that left her stumped….why would we going there? So, as I got her to confirm this as her final guess, she won a copy of the artwork they have in the room. Fast forward to Sept 29th. We became mouse hostages. We don’t go off property or get rental cars. We use the Magical Express service where they find your bags off the plane, stick you on a bus, and deliver the luggage directly to your room all for free. We check in in the lobby, and were told we were on the third floor, I was dreaming of 10 floors higher. Nothing else available that night, so we checked it out. I will say, this was even better then hoped for. The castle is small, it is not as tall as it looks. When you watch Wishes from the 15th or 16th floor roofs, you actually have to look for it. On the third floor, we actually had a direct view of it, in the correct perspective. It looked awesome. I’m actually betting 2-5th floors would have the best views. In fact, the only flaw of our view I could say, is that you could not see the surface of the Seven Seas Lagoon, just the resort buildings around it. WIN. The room, huge. 803 sq feet. Our house has a 832sqft footprint. Since the room had 2 bathrooms and a garbage disposal, Reagan proclaimed that this was better then home and wanted to move here. Walking in, we had a full bath, closet, another closet with washer and dryer, a full kitchen, bar, dinning area, and a huge living room that was solid glass with Space Mountain, Cinderella’s Castle, the monorail beam, and the Contemporary in view. Off to the side was a master bedroom with king bed, a wall that opened to a huge garden Jacuzzi tub, and then a water closet with a huge walk in shower with multiple heads. The bedroom also had a balcony, which made for great fireworks viewing. The living room had a chair that pulled into a twin and a couch that opened to a queen. Both could be out without any problems. Mason opted for the twin, up against the glass, aimed at the castle. Highlights. Epcot’s 30th Anniversary. I booked the trip without planning this, but we were there for the 1 night celebration. Besides some special merchandise, the only celebration was a extra segment past Illuminations, which seemed like was finale grade explosions, until they got to the blinding, deafening finale! WOW! Not too much to report from the parks. The new Fantasyland expansion is huge and amazing from what we could see. Test Track was still closed. The early Main St. Electrical Parade was rained out on Wed. I had just hit Main Street when the announcement came. The crowd let out a moan and proceded to exit. The park was empty until Wishes, where we camped out on the railing near Tom Sawyer Island, and I met up with an old friend and our families nearly made up the entire crowd in front of Splash Mountain when the 2nd parade went by. Food: Le Celier. Why there is anything besides Poutine, Cheese soup, and the mushroom/truffle filet on the menu is beyond me. This is a perfect meal. Marakesh was also a great, and large, meal. Mickey’s not so scary Halloween Party. The MOST fun we have ever had at Disney. Reagan and Rich dressed as Phineas and Isabella, and Mason went as Dr Horrible. The entire park was filled with theme music, fog, extra lighting, and candy. Yes, candy. You would end up in lines, and receive handfuls of candy, all over the park. Some rides were closed, but the ones that were open had no lines. Not as many people in costume as I’d expect. Quite a few kids did not dress up, most parents did not and those who did mostly went over the top. Hallo-wishes was the best fireworks show we ever saw. Great story, great effects and shaped fireworks, and wrap around the park finale. Later, the Halloween parade was led by the headless horseman, which was very cool. Long parade, all the villains, lot’s of normally unseen performers and floats. Very fun. So far, everyone wants to do the same exact trip again. For a rubble pile that is! 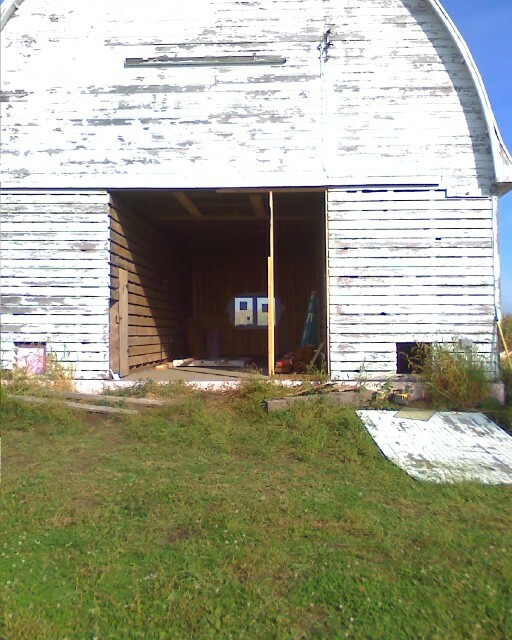 Actually, I have been salvaging the barn during the last few weeks. I’ve needed some interesting wood for other projects and the barn pile has beeb the source. We’ve already re-used: 50 pieces of siding, all of the crib wall planks, numerous pieces of 1×12, 2 2×12 joists, a 14′ 4×6, and 2 large pieces of the laminated curved roof rafters. Besides this shopping list, I’ve had 3 chances where the truck was 1/2 full, and needed to go to the dump. I topped it off by picking up all the rotted, cracked, and cut off bits that have been down there. Add the fact that I’ve mowed out a section near the barn, I can almost say that the only thing left next to the barn, is it’s side wall, and it is nearly uncovered. Went down to do a good trimming around the buildings and to mow anything that needed it. I think I’ve only mowed 3-4 times this year. Even with the drought, what was growing in the garden looked good, as did a few trees transplanted there this spring. In fact, I found a zucchini and a summer squash there that I brought home, sliced and shared with the family, as-is. Not much to report. Everything looks good, and I love it when the grass is mowed and the buildings are trimmed perfectly in the golden light of sunset. The lack of rain making the farm look like August already, and it’s only mid June. From my untrained eye, the soybean farmers are having a rough start this year. Anyhow, we found another new life for the fallen barn. You may remember that a few parts made it to Camp Coyote a few miles away, and that I’ve been using reclaimed joists over in the corn crib for remodeling. We just made a trip to find some new material to serve as a wainscoting. A found it we did. We still had the 4 original doors from the corncrib, but since one was on the ground it was rather rotten. 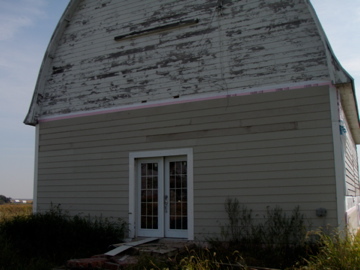 It was the same beadboard-like profile as the original barn siding. We pushed the doors out into the open using the plow on the tractor, and then pulled out a few random pieces before finding a stack of cleaned/reclaimed boards I had stashed inside the barn’s remaning corner. There should be more then enough to give character to a new place coming soon. hint hint wink wink. I got another 2 trees from the ReLeaf program this year, and found at least a dozen more small pine trees growing in my dad’s various garden beds. They range from 3.5′ down to 8″ We gathered all these and filled in some spots along the windbreak….which may be useful in another 15 years….and a few good looking spots. I also found a slew of strawberries ripe. Af days ahead of schedule for June-bearing, but WOWm were they tasty. During planting day, the helper I’ve been hiring named Karter, and I also salvaged out another 5 beams from the barn. I’m still not getting any work done at the farm, as I’ve been spending all my time on another project. Commited to everlasting energy and life in Iowa.